Oral health probiotics was one of the key topics during PER/IADR meeting 2012. The International Association for Dental Research’s (IADR) Pan European Region (PER) organized a congress & exhibition September 12-15, 2012. BioGaia and its Finnish partner Verman supported the PER/IADR congress as exhibitor to bring the latest scientific data about oral oral health probiotics to more than 1,000 scientists who had convened at the meeting to collaborate and learn cutting-edge research. Delegates had the opportunity to attend the symposium: Probiotics: Benefits vs. Risks for Dental Health which was organized by professor Jukka Meurman at University of Helsinki and professor Eva Söderling at University of Turku. 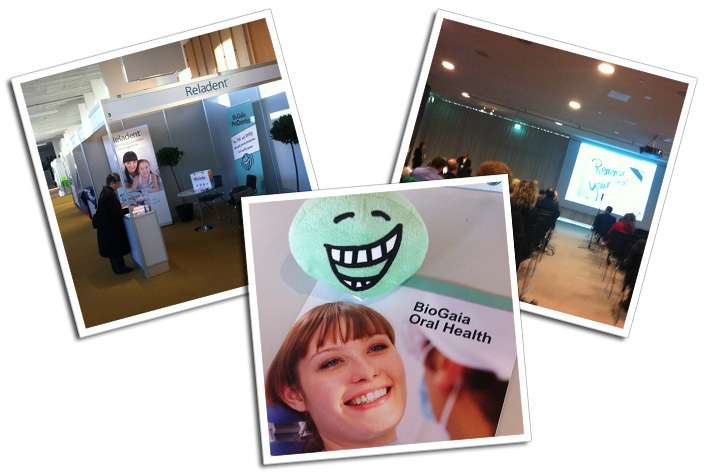 The symposium covered the basics of health beneficial bacteria (probiotics) with focus on oral and dental health. Both experimental and clinical studies have shown beneficial effects of probiotics on dental caries, but also on gingivitis, periodontitis and oral yeast infections. The speakers agreed that the probiotic mechanism of action is not fully understood although it seems it might be both local and systemic. Permanent oral colonization of probiotic strains seems improbable although rare cases in early infancy have been reported. The bacterial species investigated as “oral probiotics” mainly belong to the genus Lactobacillus which bacteria are known to ferment dietary carbohydrates to organic acids detrimental to the teeth. Consequently, safety issues are highly important if such live bacteria are administered into the mouth. New data confirmed that Lactobacillus reuteri ProDentis is not cariogenic. However, different strains differ in their fermentation capacity and hence the selection of proper strains for oral health purposes indeed is important. It was concluded that today is the very beginning of the era of therpaeutic use of probiotics in oral medicine and dentistry. However, more randomized controlled multi-center clinical studies are needed for evaluating the future role of probiotics in dentistry and oral medicine. BioGaia is a health care company that develops, markets and sells probiotic products with documented health benefits. Lactobacillus reuteri Prodentis has proven efficacy and safety through more than ten double-blind, placebo-controlled clinical trials. It is the patented combination of two complementary strains, Lactobacillus reuteri DSM 17938 and Lactobacillus reuteri ATCC PTA 5289, specifically selected for their exclusive synergistic properties in reducing plaque, gingivitis and periodontitis. Visit www.biogaia-prodentis.com to learn more about oral probiotic BioGaia ProDentis.